WCR's Flashback series revisits musicians and records out of Chicago from years past. This installment takes a look at little-known new wave act Scott Wilk and the Walls, who released one album in 1980. One thing I’ve learned from spending many hours flipping though racks of old vinyl is that you should always trust your instincts in record stores. If you think you might like something because of the artwork, song titles, date, or anything else, buy it. Especially if it’s cheap. I’ve stumbled onto many an obscure-yet-excellent LP this way – records that I might never have encountered in any other way if I hadn’t acted on impulse. 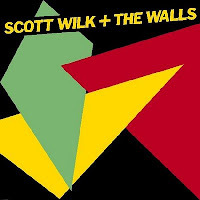 My latest discovery was the lone, self-titled album from one-time Chicago band Scott Wilk and the Walls. The simple, brightly-colored angular design on the cover screamed vintage “new wave." So did the band name and the 1980 copyright date. I have a soft spot for this kind of stuff. A large chunk of my favorite albums of all time come from roughly 1976-1985. I had never heard of Scott Wilk and/or the Walls, but at $2.98, why not? Acting on a vinyl-induced whim paid off once again. This is a really good batch of songs that, like thousands of other really good songs from that era, never got the recognition they deserved. The first thing you will likely think when giving this record a listen is something like, “Wow, this sounds like a lost Elvis Costello album.” It would be impossible not to, unless you have no idea who Elvis Costello is. Front man Scott Wilk not only delivers a very similar vocal style, but the music could have come out of the Armed Forces sessions. 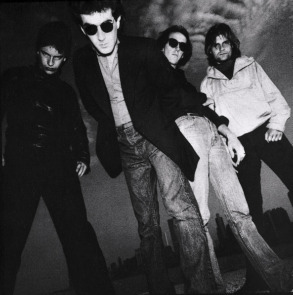 In a recent interview for Patrick Flanary's Examiner.com column that recounts the band’s history (a very in-depth read for anyone who wants to know the full story behind Scott Wilk and the Walls), Wilk himself comments that he did not consciously attempt to imitate Costello during the album’s recording. Still, there’s no denying that early Declan MacManus is all over these 11 tracks. And that’s not a bad thing. It might be if the music on here wasn’t that good. But since the quality of the material is consistently high, the band is tight and Wilk has impressive vocal chops, it doesn’t really matter. The record opens with "Radioactive," a punchy, infectious track that perfectly embodies the spirit of new wave and power pop of the late '70s and early '80s, when the energy and edge of punk were transitioning into something a bit more universally palatable. If that song represents the fun side, "Suspicion" - which was the first single and actually got a promo video - represents early new wave's sense of nervousness and paranoia. Much of the album continues down that road, as song titles such as "Danger Becomes Apparent," "Shorting Out" and "Too Many Questions" clearly suggest. "Instant This, Instant That" is a late-album highlight, which thematically seems a quarter-of-a-century ahead of its time and takes an unsuspected, doo-wop-styled turn during its chorus. Slower songs "Careless" and "Shadow-Box Love" prove just how skilled Wilk is vocally. The entire LP is well-written and there was obviously no shortage of talent in this band; there's no reason they shouldn't have received plenty of attention. Unfortunately, the album never took off. This - along with management issues - marked the end of Scott Wilk and the Walls despite the fact that the band was armed with a second album's worth of material. The lone LP remains obscure and until recently, unreleased in any format aside from vinyl (Wounded Bird Records is now selling it on CD). You can listen to vinyl rips of a few tracks below. Always loved this album. Thanks for the article. sending this back, just refound lp this weekend. had it before I mistakenly sold all my vinyl. but rebuilding my collection after 20+yrs without it. found a pristine promo copy. i'm in heaven.